Choose an issue to take action on and explain why they have chosen it. Don’t jump straight into the action part – explore the issue in depth first. Identify an appropriate way of taking action on the chosen issue, articulating reasons for this approach. Work collaboratively in groups to plan the action. Consider what they have learned about the chosen theme in planning their action. Whatever action you choose, students should try to reach as many people as possible and to involve as much of the school community in order to have a greater impact. Along the way students should communicate their chosen actions in order to raise the profile and awareness of the issue. Is the action informed by relevant facts and real life stories? Did it explore an issue that was locally and globally connected? Is it designed to achieve real change? Use the WWGS Meaningful Action Planning Template in your classroom to help you plan out what you are going to do. Here are some suggested actions you and your students could take – but remember, it’s not an exhaustive list.When brainstorming with your students on taking action, why not use the following list and ask the students to rank them to come up with a general consensus on the actions that will be taken. Create a website or social media page to raise awareness of the issue. Develop a series of lessons for classes in your school on the issue. Make a video, audio or photograph presentation to stimulate discussion about the issue, and get people to debate it. Work with media outlets – for example, give a talk on local radio or invite media representatives to an event you are organising. Something really unique and creative will attract attention for the issue you’re working on. Winners of the 2017 YSI/WWGS One World Award, Our Lady’s College, Greenhills, had an exhibition of photos of their teachers aged 13 to highlight the fact that the most common age for girls to be trafficked globally is 13. Organise an art or poetry show, or other creative platform, at your school or in your community. Make a leaflet, poster, collage, sculpture or mural on the issue and display it in your school and in the local community. Ashbourne Community School’s TY students painted a mural of the Global Goals in their school yard. Perform a play on how the issue affects people, for example, in assembly, or in other schools. Could DE be incorporated into your school musical? Beaufort College, Navan did just that and performed a Global Goals musical. Create a film to raise awareness of your chosen theme(s) and survey the change in attitudes of the audience before and after the film. Margaret Aylward Secondary School explores global issues through art amongst other subject areas. In 2016, they explored the issue of migration, simulating the experience of having to travel by boat across dangerous seas. The students put themselves in the shoes of people forced to flee and discussed and listed the items they would bring on the boat. 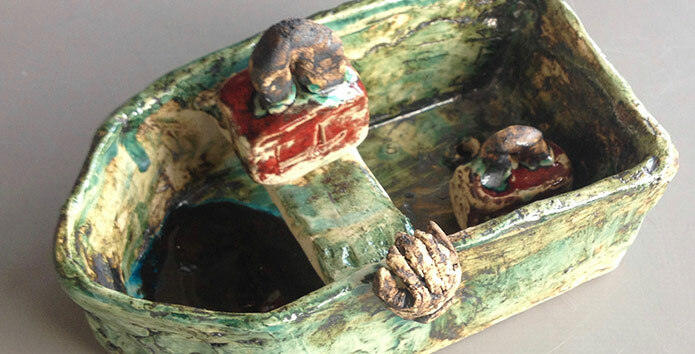 After much exploration of the issue, they set about making their own boats out of clay, and fired them in a kiln. The Botanic Gardens agreed to exhibit their boats on a pond in the gardens in the summer of 2016. The boats were on show again in May 2017 in the Ballymun Axis. Alongside the boats, artwork from students living in a refugee camp in Greece about their journey was displayed. The students also exhibited their memes work on the Global Goals and their pottery spoons as a result of exploring Goal 2: No Hunger. Students gave workshops on issues of migration and the Global Goals to accompany the exhibition. Find out what individual actions can be harnessed to respond to the issue you are focusing on and mobilise the student population to take these individual actions en masse. Take personal action: make choices about your life based on what you have learned. For example, you can change what you eat, wear and spend money on. Develop an action plan on your chosen theme(s) and present it to school management. Find out what policies or practices your school has in place (or has not) that might affect the issue you’re working on. For example, if you are learning about deforestation, can your school reduce the overall amount of paper it is using, and choose sustainable paper sources? Make your school and/or community a Fairtrade School or Fairtrade Town. Find out which organisations can help you, and join their local, national or global campaigns. Sign up for the Concern Campaign Academy to build student campaigning skills. Set up your own online petition at Set up your own online petition at www.change.org. Speak to (or put our arguments to) someone in a powerful position, for example, writing a letter or an email, sending a petition or an opinion survey. Invite one of your local TDs to the school for a discussion about your chosen theme, find out about existing government policy relating to your theme, and prepare questions. Lobby a politician on a specific piece of legislation/policy. Transition Year students doing the Global Justice module collaborated on a Climate Change project with Green Schools. During Environmental Awareness Week, they made and displayed posters (some in Irish) on the topic. Viewers were encouraged to follow the carbon footprints between different sections of the display. They made posters on the links between climate change and meat production/fishing, which were displayed in the canteen. Perhaps the most striking action as part of this initiative was students charging a Carbon Tax to all cars driving into the school car park. (Pictured here) Students also organised a whole-school day of climate change action at the end of the week. “I worked with one class group on a project that focused on access to education around the world. We looked at Malala Yousafzai’s fight for girls’ access to education in Pakistan and after surveying the school to see what nationalities were represented in the school community, we looked at access to education in 50 countries. We raised awareness about this topic by creating a large display on the corridors of the school to highlight the fact that not everybody has access to education despite it being a fundamental human right. The students then wrote letters to different world leaders asking them to commit more money to education access and are now awaiting responses. We received a very positive response from Charlie Flanagan in relation to the money that the Irish government commits to education as part of Ireland’s overseas aid”.